Need Halloween monsters for your holiday party? 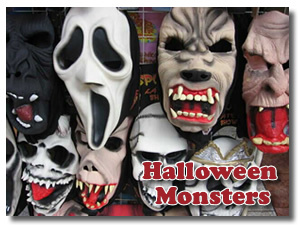 Whether you need a monster costume, monster decorations, or monster toys and chocolate for the kids, you can easily find them online. My dad always got a kick out of terrifying us as much as possible when we were kids. I have to admit, it was rather thrilling for all of us. We were never sure whether to believe his scary stories or not. One particular year he dressed up in a frightening costume and planted himself on the porch like a statue. Every single neighborhood child (and adult, I might add) who came by for 'trick-or-treat' went screaming down the steps and out of our yard when he suddenly "came alive." My mom was less inclined to try to scare us. She would find ways to make Halloween a lot of fun without all the ghosts, goblins, and witches. As we got older and came to understand the underlying meaning behind the holiday (beyond lots of free candy! ), we opted out of the traditional holiday antics because we wanted to please the Lord. Even so, I know a lot of people still enjoy the thrill of feeling chills down their spine from monsters or monsters themed parties any time of year. If that's you, you might want to check out some of these options. If you are looking for chocolate monsters, there's a simple way you can get them. You can purchase chocolate monster pops or you can easily make your own using chocolate molds! Wouldn't the kids love to make their own Halloween candy using Halloween chocolate moulds? It is so easy! You can even use something as simple as chocolate chips and the microwave. Just follow the instructions for how to mold chocolate candy. There is a nice selection of Halloween chocolate molds at Candyland Crafts. You can make monster lollipops, skull and crossbones, or any of the other traditional scary Halloween treats. I hope these ideas will give you a good starting point to make your holiday extra fun and extra special. If you do make something special, we'd love to see it. Don't forget to come back and show it off. Even if it's a bit scary, we'd love to see it!